Two a.m. A full moon casts a bright ribbon over the Gulf, sand sinks under my feet as the waves wash away, and everything shimmers in a cool shade of blue. We’re here to see the sea turtles hatch, to learn lessons from these tiny leaps of faith and their struggle to reach the sea. There are predators about, ghost crabs that eat baby turtles. Our children are horrified. They chase the mean crabs all over the shore, looking a bit like crabs themselves as they scurry, bent-over and snapping their kitchen tongs. They are amazingly agile and their mission is pure. The crabs don’t stand a chance. We come to a nest. It’s just a small slump in the sand, but underneath lie hundreds of little miracles biding their time. We look for movement, find none, and stroll on. Eight nests later we have a plastic pitcher full of crabs, but we haven’t seen a single turtle. The children break for the water. The waves are dreamy; they glide onto shore with the genteel rustle of taffeta skirts. Our children splash right in. Immediately they stop as one and gawk at the water. Splash again, swing their hands and knees, gawk some more. I scoop up a ball of water and toss it into the air; it falls, bouncing into pieces against my hands. Neon green sparks shoot like fireworks. 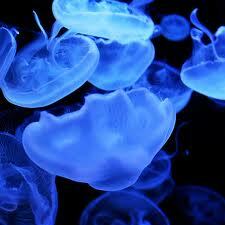 Bioluminescence, Jim explains. Tiny sea creatures emitting light.